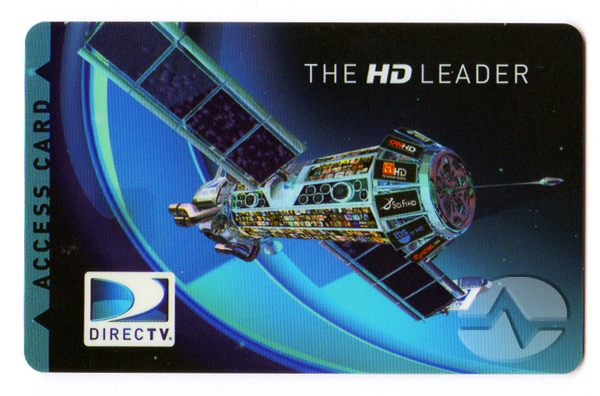 This is a DIRECTV access card. It looks a lot like a credit card, except that instead of a black strip on the back, it has a gold circle. It’s known as a “smart card” because behind that gold circle is a little bit of memory. So really it’s not like a credit card at all. It’s more like a flash drive. DIRECTV receivers have used smart cards for close to a decade. In DIRECTV lingo, they are known as Conditional Access Module identification cards, or CAMID’s. You probably know that your DIRECTV receiver won’t work without one, and you might have figured out (we’re not being judgmental here) that you can’t take yours and put it into your friend’s receiver. It doesn’t work. The access card stores a series of numbers that are unique. The access card also seems to store the receiver ID number, since you can’t put it in a different receiver. It’s possible that the access card also stores information about your programming package. The access card is checked a lot. You might have figured out (again, we’re not judging) that if you remove it you can sometimes watch TV for a few minutes, but after that you get a nasty error. So, we can guess that the receiver is checking the access card at least every couple of minutes, possibly more frequently. Another thing we know is that when you change your programming package, the access card must be in the receiver or nothing happens. DIRECTV sends a signal over the satellite that is targeted to your receivers that changes the information in them, such as whether or not you can get HBO. DIRECTV can also send other information that affects the receiver, such as refreshing services if you lose access to channels. They can force your receiver to reboot or upgrade its software. We think the access card comes into play here too. It’s pretty rare (in fact it’s been many years) but sometimes DIRECTV will issue new access cards to a whole group of people for security concerns. When that happens, the old access card stops working and you have to put a new one in. In some cases you may need to replace an access card, and when you do that, you must call DIRECTV to have them associate the access card with that receiver. It seems like if an access card is used for one receiver, it can never be used for another one. It’s not clear whether that’s a policy or a limitation with the cards themselves.